Thanks Erin, steering controls work great but it's hard not to use that volume knob. However on the iPad, the controls are much easier to use....much larger. Or you can use the remote if you want. The remote works even with the steering wheels control piece plugged in. I have lots of ways to control volume.....not to add a controller for my processor and I would have yet another way....lol. Is there some award for having so many options for volume??? There is a difference between overkill and bad. Your idea isn't overkill, it's bad. Fortunately I'll have the app running on the iPad which will be within easy reach from my driving position. yea. I was talking about control via my iPhone 6s (not plus). I tried again this morning with my iPad mini 2 and it's much easier to navigate. Do you have any close up pics of the interface? It looks like the volume buttons are large which is a good thing. I see + and - does it also work by sliding finger across? 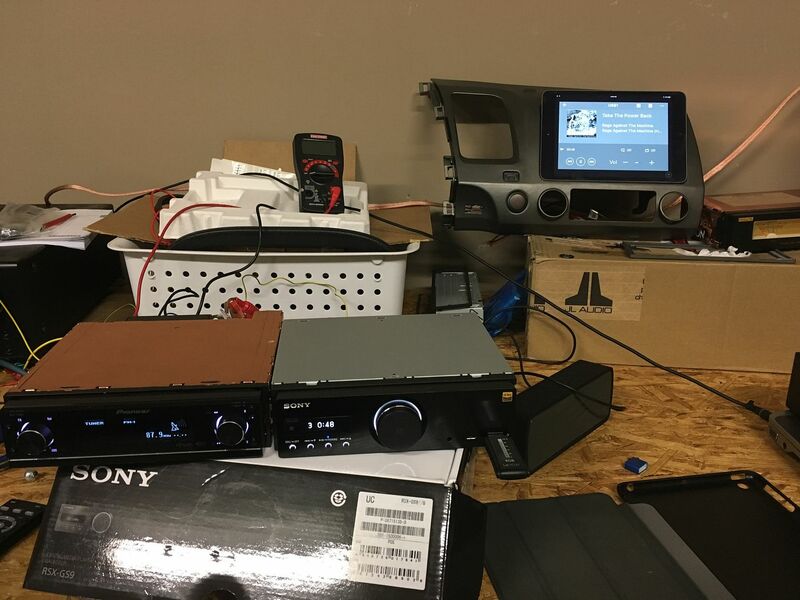 Funny thing is I put a Sony MEX-XB100BT in my boat this summer and it uses songPal as well but I only used it to stream audio from my phone and I didn't really pay much attention to anything else. Now that I'm interested in the GS9 I which I had played around with it more but now boats in storage for the winter. a. When you connect the iPad to the Sony USB input, do you connect to USB1 or USB2, and does it make a difference in functionality between USB1 and USB2 ? b. Did the USB connection from the Sony also charge the iPad? c. Each time you enter your car, did you have to reconnect the WiFi from the iPad to iPhone or it connect automatically? can you do it from the iPad Screen? (meaning you can leave your iPhone inside your pocket all the time)? If yes, how do you do this? e. if someone text your iPhone (or you want to make outgoing text using siri through your iPhone number) can you do it from the iPad Screen? f. When you are using Google map or Apple Map or playing music stored on your iPad , can you still accept incoming call from iPhone? See below, although many of your questions are functionality between the iPad and iPhone, nothing to do with the Sony. c. Each time you enter your car, did you have to reconnect the WiFi from the iPad to iPhone or it connect automatically? The Bluetooth connects automatically, but the iPad tells you to open the software and you have to swipe that notice. can you do it from the iPad Screen? (meaning you can leave your iPhone inside your pocket all the time)? If yes, how do you do this? Don't think you can, although you can connect the iPhone to the Sony and make calls through the app. What I want to do is to have an iPad to store my songs and also as large navigation screen and to accept/making phone call. The audio output from the iPad will go into Sony USB input which is perfect since now I know from you that the Sony also charge the iPad. I heard about the ability to receive/making a phone call that goes to your iPhone number from your iPad, and also to read/sent text message from large iPad screen and it will be shown as it is coming from your iPhone number. and any incoming call or outgoing call (or text) will be done from iPad, without touching the iPhone at all. I just do more research this past hour and I found out this Apple function is called Continuity. You just have to set both iPhone and iPad on same WiFi network, bluetooth on, login to same iCloud account for both the phone and the facetime. I just test it, that is how I find out it work if both device connected to my home WiFi, but won't work if the iPad is connected to the iPhone hotspot as source for internet. Replying to a thread over two years old . . . I've been doing testing integrating an iPad with my Sony for the last couple of months, and I've come to the conclusion to *not* use an iPad for my particular scenario. 1) Steering wheel controls work for activating Siri, volume, and track forward/reverse, album forward/reverse. 2) Voice call integration through the system. 3) Control the Sony with the SongPal App. 4) Play native DSD music into the Micro USB port on the front using the Onkyo player. 6) Waze w/ turn by turn directions. 1) iPad Pro 9.7 512 with LTE - Get the baddest one they have, right? The 12.9 I know would be too big so went with the Pro. Well, I found it to be be too big as well. I did figure out you can run two iPad apps side by side as part of iOS, pretty awesome. Makes up for the fact the Onkyo app can't do landscape. 2) iPad Mini w/out LTE - Just the little guy without LTE, because I got the iPad to piggy back off my iPhone set as a hot spot. That worked, but as it turns out, the iPad Mini w/out LTE doesn't have true GPS, so you can't do turn by turn directions. 3) iPad Mini w/LTE - Once I figured out the right iPad, I then moved on to all the integration fun. 1) This deck is, to quote Josh, "picky." 2) The Sony can't pair with more than one Bluetooth device at once. 3) The front USB1 port can play DSD 2.8 (it converts to PCM from Sony's FAQ). I've tested this with a USB stick and DSD content, it works. 4) The autoconnect feature of the deck to songpal is super annoying but can be disabled via a menu option and firmware 13. 5) The bluetooth connection from the device to the Sony for BT Phone and Audio doesn't mean the connection from the SongPal app and the Sony is there. 4) If you turn off autoconnect, I couldn't get SongPal to see the deck if I launch the app. Not even if I tried the CONNECT feature in the Sony menu. However, if I changed sources from USB1 to USB2, that would "kick the connection in." 5) The on-star integrated kit from axxxess just plain kills power to the HU. Functional but awful. I'd get a call on my iPhone, that would kick in the existing handsfree in the car, and turn off my stereo. 6) Having a gazillion devices in a car with bluetooth and wifi is a nightmare. 7) When using an iPhone as a hotspot for an iPad to make phone calls it doesn't work. Well, it looks like it works, but the audio is not there. I tested this by getting both my iPhone and iPad on my home network outside my house and then the audio is there. To my chagrin, the call info is not displayed on the iPad when making outbound calls. So I can't mute, nor end the call. My assumption is the Hotspot does use Wifi, but bridged so the devices really aren't on the same WiFi network. 8) Apple car play, while dumbed down, is a FAR superior integrated experience than the SQ "picky" Sony. I had a rental with it and it just plain worked. 9) When plugging into the USB1 or USB2 ports with iPhone or iPad, the deck controls work for all the apps: Spotify, Apple Music, Onkyo Player. 10) Obvious but will state it anyway, when using the iPad or iPhone to the USB DAC, none of the above controls work. 11) Getting a charge via the USB camera kit seemed finicky for the iPad. 12) I couldn't figure out a way to have my iPad automatically join my iPhone hot spot and had to manually do it every time. 13) When I setup the iPad, it learned all my wireless networks, which in theory is cool, but not when some wifi networks have MAC address filtering on it, so it joins, but doesn't work. 14) The iPads seem to be designed to hold in your hands to use. Jabbing and swiping at it was not pleasant. 15) The screen size of an iPhone is adequate for Waze, Spotify, and texts. 16) Using my iPhone by itself with the Sony is by far the best integrated experience. *Not having to make two Apple devices and the Sony play nice together. Phone calls work beautifully over BT PHONE, sound comes out of Sony, input mic into Sony. Whatever music playing is paused and when the call ends, the music begins to play again. *All iPhones have true GPS so Waze gets turn by turn. *The iPhones have much greater storage capacity (512 now) than the iPad Mini (128 only). *One less place to keep my music snychronized to. *iPhones, as large as they are, don't have the screen size of an iPad. When I had the iPad Pro, it's like my Caddy became a Tesla. * I'll have to manually get my phone out of my pocket and plug it in or dock it. I was so fed up with the integration at one point was ready to so say eff this deck, I'll just get a wireless Apple Car Play deck. Then my SQ senses came to me. The iPads are gorgeous and for just controlling the Sony and doing play back are awesome. It seems my requirement for hands free calling through the Sony forces me to iPhone only with this deck. I'm OK with this but would love to know if anyone has figured out a better way to make all this gear play nice together. Glad to see your testing is pretty much done(?). My conclusions on this unit are this.. i will only install it if its for someone who is batshit crazy over SQ. Anyone less can live with something like a kenwood 995s. In order to do this, you need a SEPARATE Wi-Fi source where both your iPad and iPhone will connect too that Wi-Fi. I think Cadilac have Wi-Fi module as option, right? or you can buy Wi-Fi module from Verizon or AT&T. Yes, I have tried this setup because I was considering a MiFi as the way to get around the issues I was seeing. I tested this control: On my home network where both my iPhone and iPad are on the same wireless network, Continuity works beautifully. I can use Siri on the iPad to "Call Apple." Phone interface comes up automatically on the iPad, uses my iPhone for the call, comes out the speaker and uses mic of iPad. I then move to my car (close enough to where both are on my home wireless). I have my iPad connected to the Sony via Bluetooth and not my iPhone. It intermittently works. Sometimes Siri listens, sometimes not. Sometimes the call goes through, sometimes not. It seems to me that the Sony isn't really expecting an iPad for phone calls/voice commands when connected via Bluetooth. I wish it worked more solidly, but the Sony has proven to be consistently "picky" so I am going with fewer moving parts to eliminate places where it can be upset. Perhaps others have a different experience, but without a doubt: I have had the most consistent experience making phone calls, controlling the Sony, and playing back music through my Apple device, when *only using a single Apple device*. Since the phone call integration is a requirement, that means my single Apple device is the iPhone.